Propaganda leaflets potentially sent by balloon from North Korea have been found in South Korea’s capital, photos provided to NK News this week showed. 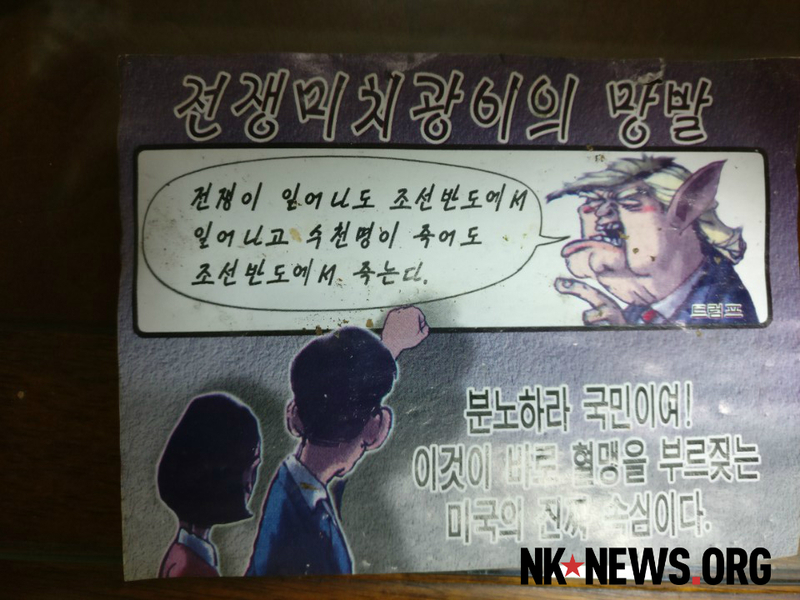 The pro-North leaflets, which attack the Trump administration and current U.S. policy towards the DPRK, were spotted on Mount Bukhan in northern Seoul between Tuesday and Thursday. 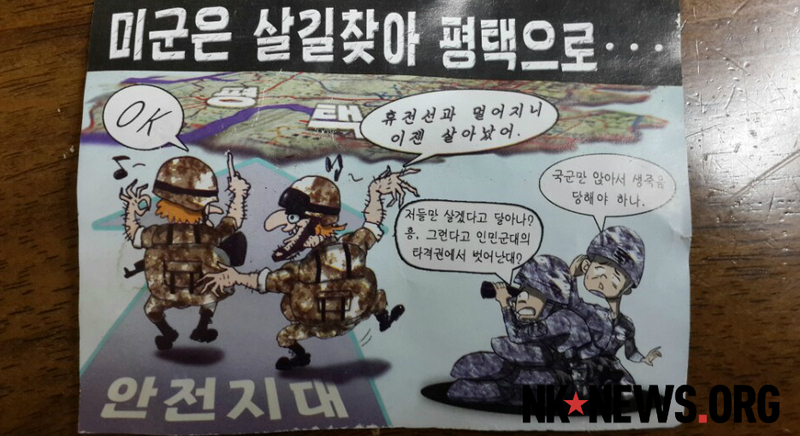 Many of the leaflets also show off Pyongyang’s military capabilities against Washington. 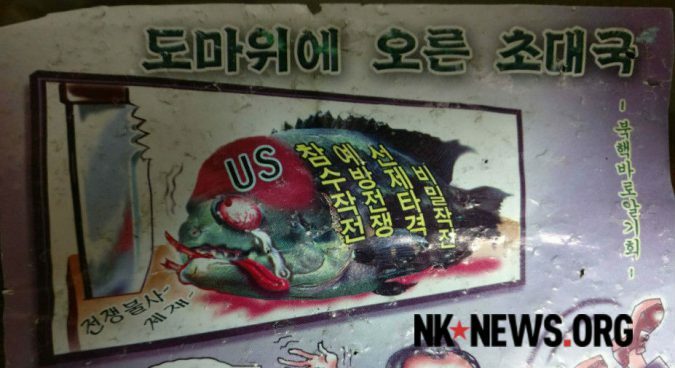 One describes “A superpower on a cutting board,” and portrays the U.S. as a dying fish on a chopping board. 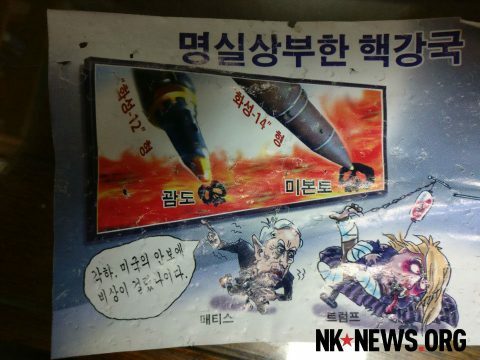 “Decapitation operation” refers to regular drills by the U.S. and South Korea on the peninsula, in which soldiers train for a “decapitation” of the DPRK leadership in event of war. 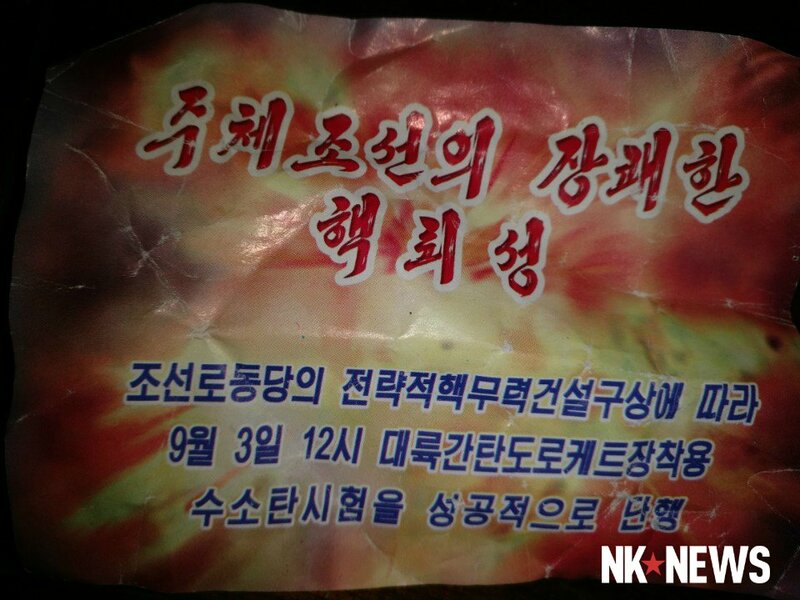 Another leaflet, describing North Korea as a “Truly nuclear power” shows the Hwasong-12 ballistic missile targeting the island of Guam and the Hwasong-14 intercontinental ballistic missile (ICBM) hitting the U.S. mainland. “Your Excellency, the U.S. security is put on emergency alert,” a caricature of U.S. Secretary of Defense James Mattis tells President Trump. 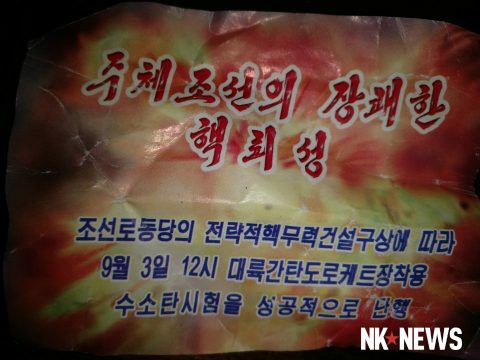 Another leaflet features the Pukguksong-2, Hwasong-12, and Hwasong-14 rockets threatening Washington. “If there is a minor sign of decapitation operation, preventive war, preemptive strike and secret operation, we will mercilessly devastate with our preemptive strike,” it reads. 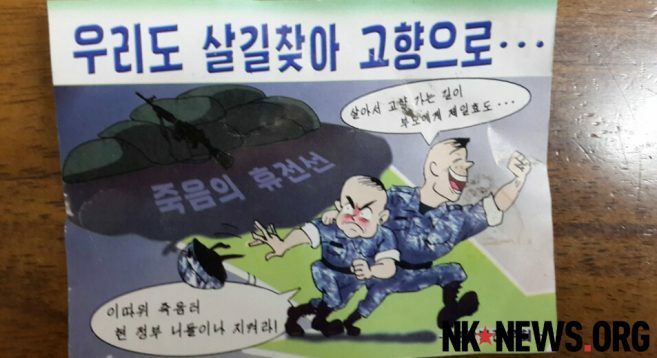 Another shows American and South Korean soldiers in a pair of crosshairs, and criticizes recent joint military drills between the U.S. and the South. “Rage people! 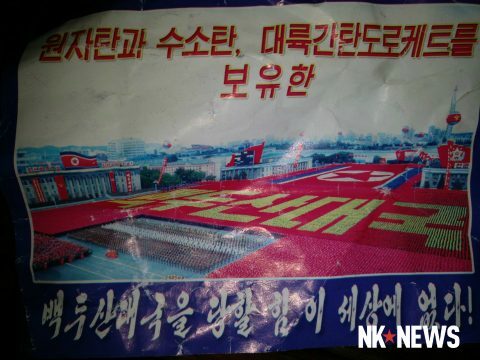 This is the real intention of the U.S. clamoring for the blood alliance,” the leaflet read. “Do they run away for their survival? 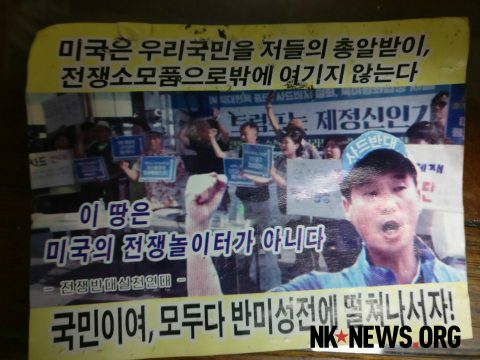 Do they can get out of the striking range of the Korean People’s Army?” a South Korean soldier says, with another soldier expressing concern that only the South Korean armed forces would perish. Two other leaflets promote recent nuclear and missile tests by the North. “There is no power in the world who can match with the great power of Mount Paektu who possesses atomic and hydrogen bomb and an intercontinental ballistic rocket,” it read. 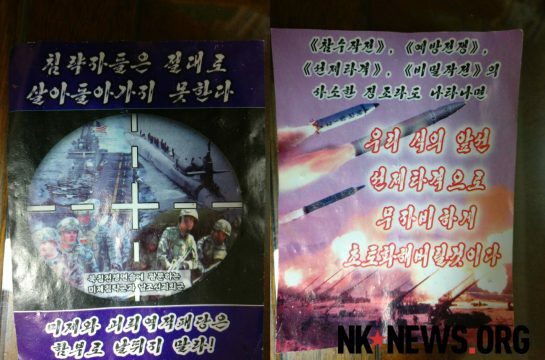 Several other likely North Korean leaflets appeared in central Seoul locations over the weekend, promoting North Korea’s September 3 hydrogen bomb test and attacking South Korean President Moon Jae-in’s policies. South Korean media has reported leaflets appearing in Seoul and Gangwon province in recent months. A deluge of leaflets appeared in the South between November 2016 and March this year. 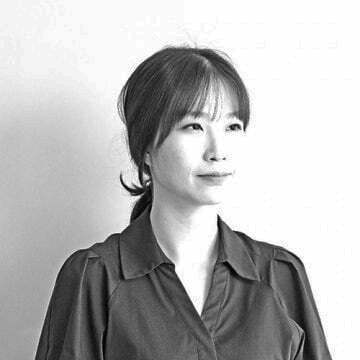 Topics included former President Park Geun-hye, the then-recently inaugurated U.S. President Donald Trump, and emerging solid fuel North Korean missile technologies, among others.